I was just gonna post this in the Fan Art page but I feel the need to talk about it. This Christmas was a real bear, mostly due to my own stupidity. Christmas eve was Friday this year, but for some reason I thought it was Thursday. My plan was to go to my parent’s house immediately after work on Thursday – which meant I needed to get Friday’s strip done a day ahead of schedule. Now, normally it takes me a whole day to crank out a strip. Drawing the strip isn’t too difficult; from blank paper to finished comic is about two hours. What takes all day is the writing. I usually write several drafts of each strip, making hundreds of alterations until the eleventh hour. So the idea of writing and drawing an extra strip, in addition to doing all my Christmas shopping, was daunting. But I was up for the challenge. Eye of the Tiger and all that. So I dove headfirst into my work and, after several late nights, I made it. I got Friday’s strip done by Wednesday night. Big pump-fist. Woo-hoo! I did it! Now, it’s Thursday morning and I’m at work. I already wrapped presents, packed my suitcase, and loaded my car the night before. I’m feeling good about my accomplishments. Then, the rusty gears in my brain start to turn. I start getting that feeling that something isn’t quite right in Adamville. I check a calendar and realize that I didn’t have to go to my folk’s house till tomorrow. All that work, all that sweat, all that extra effort. For what? For nuthin! I drove home (my home) after work, unloaded my car (because I had stuff I didn’t want in my car overnight) plopped down in my recliner and sulked. Glad though I am for getting ahead of my work, I’m still bummed. So I was in a slightly crummy mood when I checked my email and saw a message from Simon. Simon had been reading my comic for a while and was kind enough to turn his girlfriend, Kat, on to it. Kat is tremendously talented with a needle and thread. Simon enclosed a pic to show just how talented she is. What I saw changed my mood 180 degrees. 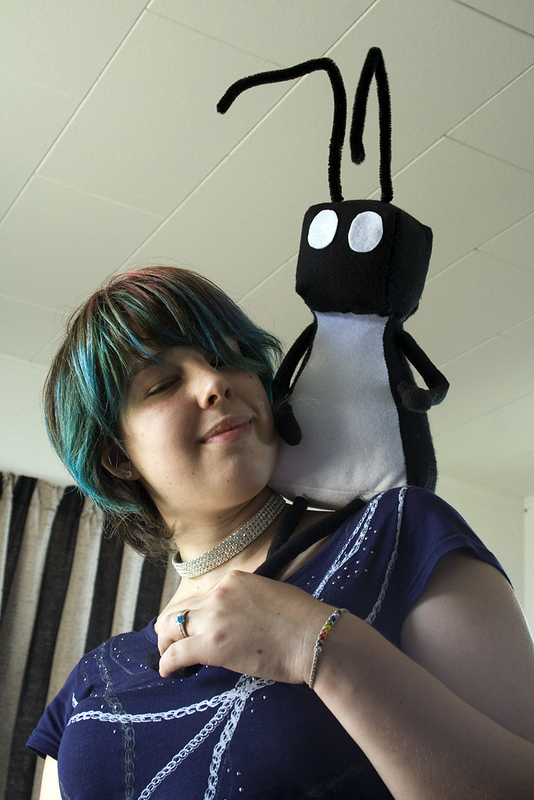 I was lucky enough to have someone make a plushy for me in an art exchange called MAX. They even sent it to me for the cost of shipping, so I know exactly how you feel! OMG I want one! So cute!! I'm glad your Christmas was saved from sucktitude. The plushy is the bomb, and I am oozing jealous right now. I hope 2011 rocks out like a bandit for you. BTW I'm the Simon mentioned. This is by far one of the best Christmas Gifts I've ever gotten. And for the comic author to love it just makes it that much cooler. I hope they send you one for real: that is neat stuff! That's a really cool toy! Nice Bug, and I'm glad that your sucky day was vastly improved. Also, I've seen pink hair, and I've seen green hair, and always thought Why in the hell. Kat's is the first not-found-in-nature hair color job of which I've thought, Hey, that looks pretty cool…. Adam, I just wanted to let you know that I appreciate the time you put into your writing; it definitely pays off! You have one of the most consistently funny comics on the web, in my opinion. I've already tried to convince her that these would be popular (and I'd kind of like a cowboy one 🙂 but she's skeptical. So everyone that would like one please comment massively to encourage her. Thanks Adam for the great comic and thanks Kat for putting me on to it. May you both benefit inordinately from your endeavors. I keep coming back to see how awesome this is, and I realise I haven't commented. Great work! It looks amazing. She could make some serious money if she could find a way to mass-produce those. Hi there, everyone, its Kat! I'm currently making something special for Adam, but rest assured I may make a few more – maybe if I send them to him he can sell them for millions! @Josh, Thank you, you should see me when I've had a relaxing day, not a full on, noisy, busy Christmas! Uggghhh. @Rhea, thank you, I love colouring my hair, I often worry I am too normal, so having a bitchin' hair-do makes me feel like I can face the world. May i say epic pwnage? And my congrats to Kat for making such a great thing out of hand sewing and kitchen scissors. I would gladly chip in to send a sewing machine to New Zealand if it meant more bug plushes floating around. Actually, that sounds like its own worthy goal – "send a sewing machine to a random person in New Zealand".